While I was in the kitchen cooking an eggplant pasta, I was listening to Sunshine , a beautiful song by the famous British band Keane. I find this song so atmospheric – it has a very ethereal sound. The song is about finding a home in someone, out of all the people in the world…so beautiful. As I opened my mail today, I found a new post – Which came first “The egg plant or the egg?” – from the blog Camerahols / Food, Photography & France , written by the famous British photographer, Roger Stowell (who is also a superb writer with a great sense of humor). I was pleasantly surprised to find out that in that post, Roger Stowell mentioned that I was off to Vendée, France – where he lives – to take his food photography course – Camerahols. So before going to France, I wanted to make a recipe inspired by this new and exciting experience. 2 tablespoons of grated French “cheese”. Using an immersion blender combine baked eggplants and sunshine. Add the Brit pop and combine well. Gently fold in the French atmosphere. Add cheese!!!….. Ciak!! Thinly cut 20-25 round slices of eggplants. In a skillet heat olive oil over medium-high heat. Stir fry eggplant slices until golden, Set aside. Preheat the oven to 200°C (about 400°F). Cut eggplants in two halves lengthwise and bake them for about 30 minutes or until tender. Let it cool. Cut eggplants into cubs. Combine eggplants, Parmigiano Reggiano cheese, and extra virgin olive oil. Using a whizzer, mix these ingredients well. Add water to get the desired consistency. The sauce does not need to be thick; it should be a bit runny. Cook pasta under package instructions. For this recipe I used pappardelle, which is a type of pasta larger and broader than fettuccine. When pasta is cooked, combine with eggplant sauce. Add cherry tomatoes and fresh parsley. Garnish with four or five eggplant rounds. Sprinkle with extra grated Parmigiano Reggiano cheese. This looks wonderful. Have fun in France. That’s so exciting you’ll be doing his class. Thank you Greg!! Yes it is exciting! Your recipes sound and look great! I was wondering, for those of us across “the Pond,” could we substitute Quebec air for French atmosphere? Enjoy this “meeting of the minds” in France. Buon viaggio! Thank you! Of course you can substitute with Quebec Atmosphere! Love the eggplant cream. I know you will have a wonderful class with Roger. I can’t wait for the photos and recipes from both of you. Have a great trip, wish I was joining you. Thank you Karen!! We will keep you all posted!! Very cool. You will have to give a detailed report of your trip. It sounds like so much fun! Two great recipes!!! I think we are all excited for you about your forthcoming trip to France…can´t wait to see what you “cook up” together with the food and photos! Mil gracias Chica!! We will sure keep you posted!!! That’s a good pasta – quite on a par with the lovely writing that set the post in motion. Tres cool. Exciting news on your trip and an exciting pasta dish! You know I love my eggplants and to make a sauce is a great idea. I’ve seen chunky eggplant sauce but your idea to thin it out is marvelous!! Thank you!! I love eggplants too, so I often try to come up with different recipes!! I hope you try it! I took a long tour of his photography site and the pictures are incredible, now if I could get my camera to do the same! You are very sweet!! Eggplants are so versatile since you can cook them in so many different ways!!! You can even substitute meat with eggplants in a burger. Just cut a thick slice and grill it. I am glad you listened to Sunshine!!! Thanks for your lovely comments! Great recipes! The eggplant cream sounds amazing. 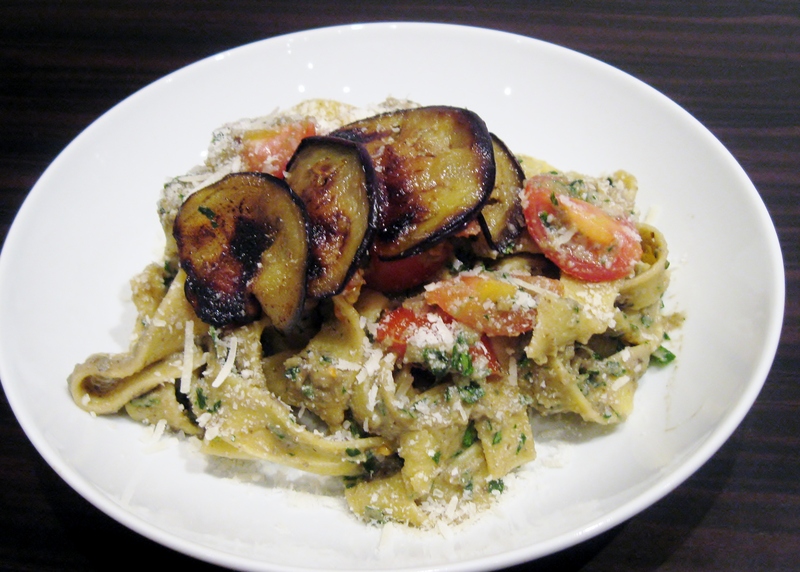 I love finding new ways to use eggplant, especially if it includes pasta! Have fun in France! Thank you!! And thank you very much for stopping by! !